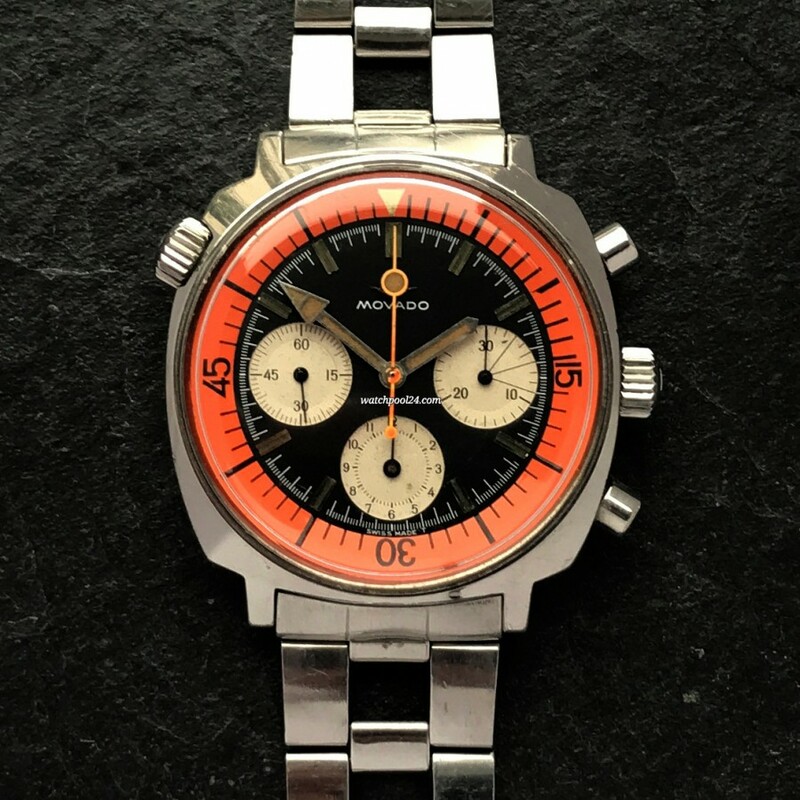 This rare diving Chronograph Movado Super Sub Sea with orange colors is very eye-catching and attractive. The merger of Zenith and Movado at the end of the 1960s led to an exchange of the calibers of the both manufacturers. For this reason, the Movado Super Sub Sea is powered by the famous Zenith 146-HP movement, as well as the well-known Zenith Super Sub Sea Reference A3736. This caliber was the last manual wind movement by Zenith-Movado after the introduction of the automatic El Primero movement. The popping design makes this watch look sporty and lively. The dial is 100% untouched. Original camouflage lume is completely intact in all parts. The lollypop chrono hand adds extra portion of coolness to this timepiece. The unpolished case with slight traces of wear certainly increases the collector's value. In addition, this diving model with the rotatable orange inner bezel is rarer and more popular than the variant with the rigid tachymeter scale. The watch comes with it's original Gay Freres bracelet with diver extension, original endlinks Ref. ZG and Movado signed clasp.